All combinations are served with rice and beans. Choice of fillings: chicken, shredded beef, ground beef, mushrooms or cheese. Create your own combo from the following items: Burrito, Enchilada, Taco, Tamale, Quesadilla or Chile relleno. One folded flour tortilla filled with cheese and your choice of steak or grilled chicken. Served with rice, lettuce, tomatoes, and sour cream. Tender steak or grilled chicken sautéed with onions and green & red peppers. Served with rice and beans, lettuce, tomatoes, guacamole, and sour cream. Grilled chicken strips on a bed of rice and topped with our cheese sauce. Four crispy beef or chicken chimis covered with cheese sauce, served with tomatoes, guacamole, and sour cream. Two rolled corn tortillas stuffed with your choice of shredded beef or chicken then deep fried. Served with lettuce, tomatoes, guacamole, and sour cream. One ground beef burrito, topped with cheese, lettuce, sour cream, and tomatoes. Served with rice and beans. Grilled chicken strips on a bed of lettuce mixed with carrots, cabbage, cucumbers, chopped tomatoes, and croutons. Shrimp sautéed with onions and green & red peppers. Served with rice and beans, lettuce, tomatoes, guacamole, and sour cream. 2 Steak flour shell tacos with lettuce, cheese, tomatoes or cilantro, and onions. Served with rice and beans. Tender pieces of pork coated in our special recipe. Serve with rice and beans, lettuce, tomatoes, avocado, onions, jalapeños and tortillas. A flour tortilla stuffed with cheese and your choice of shredded beef or chicken, deep fried to a golden brown. Served with rice, lettuce, tomatoes, guacamole, and sour cream. One chicken burrito and one chicken enchilada topped with lettuce, sour cream, and tomatoes. Two shredded beef burritos covered with cheese and red sauce. Served with lettuce, tomatoes, and sour cream. YOUR CHOICE OF SHREDDED CHICKEN, SHREDDED BEEF, GROUND BEEF, BEANS, MUSHROOMS OR CHEESE. FLOUR SHELL TACOS ADD 40¢. ALL TACOS, ENCHILADAS AND TOSTADAS TOPPED WITH LETTUCE AND TOMATOES. Add grilled chicken or steak $1.00 extra per item. Add grilled shrimp $2.00 extra per item. 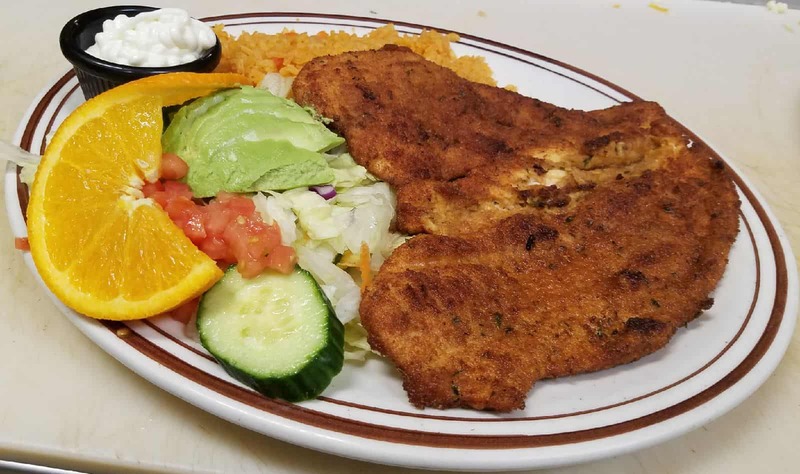 Your choice of grilled steak, grilled chicken or salchicha. Serve with beans, mayonnaise, cheese, lettuce, avocado, tomatoes, onions, and your choice of French fries or onions rings. Served on a platter with rice & beans, shredded beef, or beef & beans. A flour shell tortilla wrapped with ground beef, cheese, lettuce, tomato. Topped with chili add $0.40 each. served with sour cream, guacamole, and topped with our special salsa. Beef & vegetable chunks simmered in our special sauce, rice & beans, and three flour tortilla. Crispy flour tortilla layered with your choice of topping: melted cheese, lettuce, tomatoes, and jalapeño peppers. Your choice of bean, beef, or combo. An open faced hamburger smothered with chili, melted cheese, and chopped onions. Served on a platter with rice & beans. Topped with chili add $ 1.50. Chips with your choice of grilled chicken or steak sautéed with grilled green & red bell peppers and onions. Covered with shredded cheese and cheese sauce. Served with rice & beans. Substitutions are $0.50. 1 Beef Taco, 1 Bean Tostada and 1 Beef Enchilada. 1 Beef Taco, 1 Bean Tostada, 1 Beef Enchilada, 1 Beef & Bean Burrito and 1 Sancho. 1 Beef Taco, 1 Beef & Bean Burrito and 1 Beef Enchilada. Chips, Cheese, Beans, Meat, Tomato, Onions, and Jalapeño Peppers. Steaks, Seafood and Carnes dishes. 14 0z T-bone. Served with carrots, brócoli and rice. A grilled ribeye steak topped with mushrooms and onions. Served with spanish rice, refried beans, and flour tortillas. 14 Oz t-bone covered with salsa ranchera. Served with rice & beans, and tortillas. 3 steak flour shell tacos with lettuce, cheese, and tomatoes. Served with rice and beans. Shredded pork in a Green salsa. Served with rice &beans and tortillas. Delicious fresh water shrimp cooked with our secret sauce. Served with rice, lettuce, cucumber, and tomatoes. Grilled shrimp in our special hot sauce. Served with rice lettuce, avocado, tomatoes, onions and tortillas. Shrimp cooked with red onions, tomatoes, cilantro and special house sauce. Served with rice and salad. 3 shrimp tacos served with lettuce, tomatoes, avocado slices, and a side of rice. 14 0z T-bone toped with grilled jalapeños, tomatoes and onions. Served with rice & beans, and tortillas. A tender seasoned chicken breast, a tender ribeye steak and grilled shrimp served with rice and beans. Skirt ribeye steak served with rice and beans, lettuce, avocados, tomatoes, and jalapeños. Three steak tacos with parmesan cheese. Served lettuce, tomatoes, guacamole, sour cream and rice & beans. Grilled strips flank steak in our special mole sauce Served with rice & beans and tortillas. A hot rock with a combination of shrimp, langostino, tilapia, scallops, mussels and imatation crab meat in our special recipe. Delicious shrimp cooked to perfection in lime juice and serrano peppers, garnished with sliced ​​red onion, cucumbers, avocado, orange wedges, and tomatoes. Jumbo shrimp stuffed with cheese and wrapped with bacon. Served with rice, lettuce, tomatoes, cucumbers, and side of our special dressing. Cooked shrimp in a tomato juice, with chopped avocado,onion, cilantro, and tomatoes. 3 tilapia tacos served with lettuce, tomatoes, avocado slices, and a side of rice. All fajitas are delivered sizzling with grilled onions and red & green peppers. Served with lettuce, guacamole, tomatoes, sour cream, rice and beans, and flour tortillas. Chicken, steak, shrimp and chorizo. Chicken and shrimp sautéed with red onion, red pepper, broccoli, and pineapple. Served with lettuce, tomatoes, guacamole, sour cream, rice & beans, and flour tortillas. Grilled chicken breast with grilled shrimp and cheese on top. Served with rice, broccoli, carrots, and flour tortillas. Grilled chicken strips with our special chipotle sauce. Served with rice, lettuce, sour cream, and tomatoes. Grilled chicken strips with chorizo (Mexican sausage) and melted cheese on top. Served with rice and beans and flour tortillas. Two breaded chicken breast. Serve whit rice lettuce, tomatoes and tortillas. Three corn chicken enchiladas covered in red sauce. Topped with cheese, lettuce, tomatoes, guacamole and sour cream. Served with rice & beans. Three potatoe & chorizo enchilasdas serve rice and beans, lettuce, tomatoes and sour cream. Grilled chicken strips with poblano peppers. Served with rice and beans and flour tortillas. Grilled chicken strips on a bed of rice topped with our cheese sauce and flour tortillas. Grilled chicken strips in our special mole sauce. Served with rice & beans and flour tortillas. Three fried flour tortillas stuffed with chicken. Served with lettuce, guacamole, tomatoes, and sour cream. Rice and beans on the side. Choice of chicken, ground beef, or shredded beef, with lettuce, tomatoes, and sour cream. Add grilled chicken or steak for $ 1.00 more. Add guacamole $ 1.00 more. 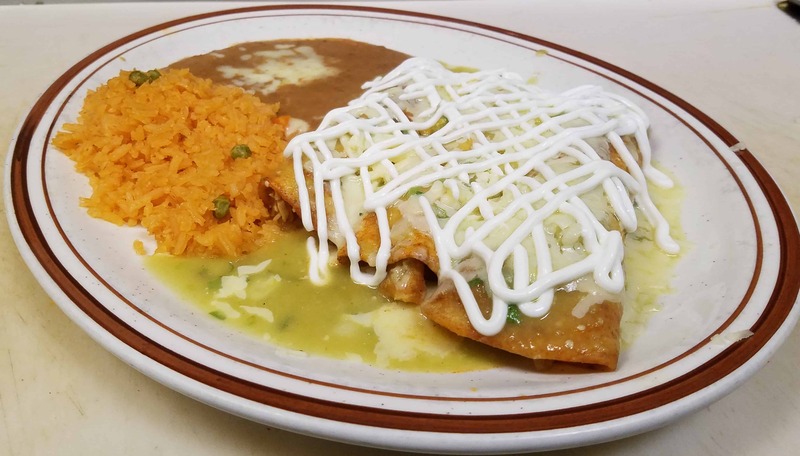 Three chicken enchiladas covered with cheese, green sauce, and sour cream. Served with rice and beans. White Zinfandel, Chardonnay, Moscato, Merlot, Carbernet and sangria. Served with rice & beans or french fries, or onion rings. cucumbers, chopped tomatoes and croutons and cheese. Shredded cheese surrounded by tortilla chips. tomatoes, cheese and black olives. Crisp lettuce, chopped tomatoes, & cheese served with your choice of dressing. ALL SANDWICHES ARE SERVED WITH FRIES OR ONION RINGS. © 2019 Los Amigos Bettendorf. Designed by Michael Wallace Designs, LLC.